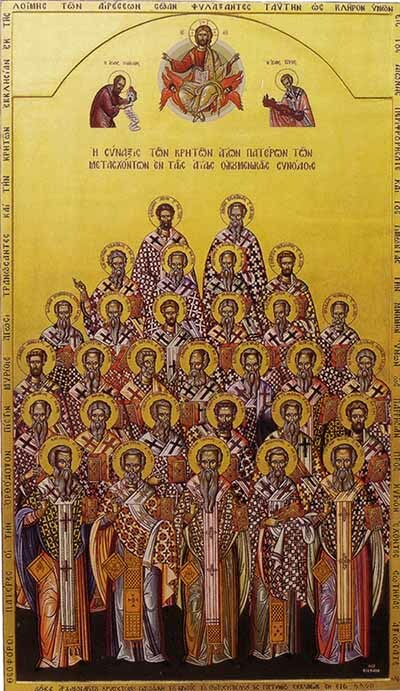 For all the Holy God-bearing Fathers who participated in Ecumenical Synods, at the initiative of Father Chrysostomos Papadakis and the foresight of Metropolitan Cyril of Gortyna and Arkadia, their Service and Supplicatory Canon was drafted and published with the approval of the Holy Eparchial Synod. This renowned Hierarch also erected a Temple to them in the year 2000 in Livadiotis (en route from Moires to Pompia) which he was unable to inaugurate. The memory of all the Holy Fathers of Crete who participated in all the Holy Ecumenical Synods was set to be celebrated on the Sunday after the Sunday in which is celebrated the Holy Fathers of the Seventh Ecumenical Synod in the month of October.